Backs, like feet, come in different shapes and sizes. Just like shoes, back products must fit your unique anatomy. The spine has three natural curves: an inward curve at the neck (cervical lordosis), an outward curve at the upper back (thoracic kyphosis), and an inward curve at the low back (lumbar lordosis). 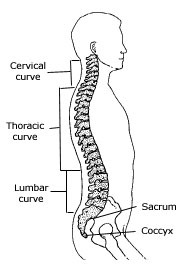 Spinal curves vary in shape from person to person. They can also change - sometimes for better, with exercise and training; sometimes for worse, with aging, injury, disease, or poor posture habits. We describe natural spinal curves in terms of a size: flat, average, and deep. In our catalog you will find symbols near each product to indicate the spinal contour size each product supports. Knowing your size alone does not guarantee a good fit. Just like shopping for shoes, even if you know your size, you have to try it on to be sure it fits. 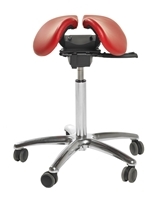 You must similarly "try on" a chair, sleep pillow, or back support to insure that it will fit and function properly. Let comfort be your guide. A spinal support's curves should be deep enough to support your particular curves without pushing beyond your neutral postures. It should feel natural. You should not feel too arched; nor should you feel unsupported, as though there were a gap between you and the support. No long-distance fitting method is perfect. The only way to be sure a chair, mattress, pillow or other back care product fits is to try it on and use it for a few hours -- or a few days even. Unfortunately, this is not practical for a mail order business. Most support products are not returnable after use. That's why we encourage you to explore your product options with your local vendors first, especially for large furniture items that are expensive to ship.